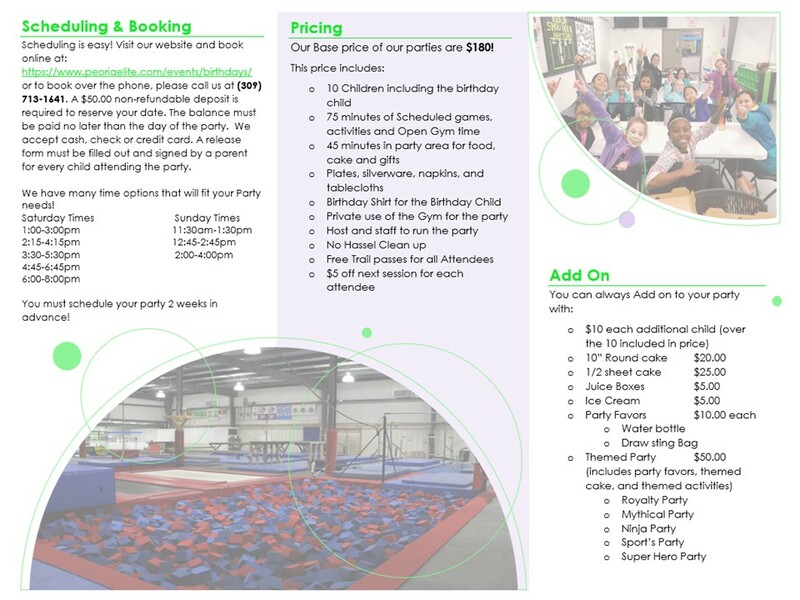 Make your child’s birthday wish come true with a FUN-tastic PARTY at PEORIA ELITE GYMNASTICS ACADEMY! We have everything you need for fun, stress-free birthday parties. Our trained instructors will host a party for your child that emphasizes both fitness and FUN! The best part is our instructors take care of all the details so you can enjoy time with the kids at the birthday party too! Available party times include both Saturday and Sunday afternoons, for 2 hours. The children will first spend 75 minutes in the gym for open play and structured games and activities. Your group will then have 45 minutes in our party area to enjoy cake, ice-cream, treats and gift opening. Don’t worry about clean-up…we take care of that for you! Children do NOT need to be registered for classes at PEGA to have their birthday party at the gym. Our ALL SEASON facility provides a comfortable temperature any time of the year! It is air conditioned during the warm months and heated in the cold months. Peoria Elite, your birthday party destination for children of all ages! Our Birthday Parties are designed for KIDS of pre-school and school age to have fun in our facility and on our variety of equipment. We ask that parents NOT use any of the equipment during the birthday party. The parents of the birthday child are allowed out on the floor to take pictures of the party if they desire. Now offerING Ninja Parties for age 6 and up!!! Birthday Parties are subject to our Open Gym Safety Rules, which the staff will enforce. All children in attendance must have our General Activities Waiver filled out and signed by their own parent or legal guardian in order to be allowed to use any equipment. Please click on the date on the calendar below that you would like to book and complete the form. The times that appear on the calendar are the available time slots. If no times are listed on a particular day, that indicates that all the parties on that day are fully booked. For booking assistance, please call us to book at (309) 713-1641. A $50.00 non-refundable deposit is required to reserve your date. The balance must be paid no later than the day of the party. We accept cash, check or credit card. A release form must be filled out and signed by a parent for every child attending the party.